Two men and two women have spent 200 days in a simulated space lab in Beijing, setting a record for the longest stay in a self-contained "cabin." Volunteers of the first group and the second group wave in the cabin at Beihang University in Beijing, January 26, 2018. 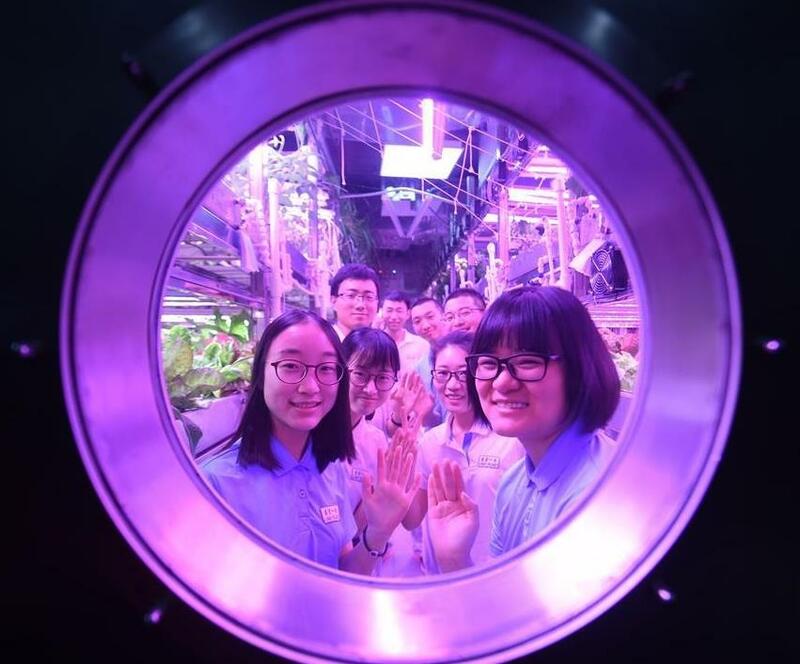 The biomedicine students from Beihang University, the second group of volunteers to stay in Yuegong-1 (Lunar Palace 1), completed the second phase of a 365-day on-ground experiment Friday. The first group of volunteers stayed in the cabin for 60 days and re-entered the cabin Friday, replacing the second group, and starting the third and final phase of the experiment, which will last 105 days. The experiment is designed to test a bioregenerative life support system (BLSS), in which animals, plants and microorganisms co-exist in a sealed environment, simulating a lunar base. The experiment also examines the physical and mental conditions of humans in such environment. Oxygen, water and food are recycled within the BLSS, creating an Earth-like environment. Liu Hong, chief designer of Yuegong-1, said the purpose of the new program was to test the stability of the BLSS when "astronauts" take turns living in the cabin. "The second stage, during which three unexpected blackouts occurred, has challenged the system as well as the psychological status of the volunteers, but they withstood the test,"she said. The 200-day stint broke the record set in the former Soviet Union, where three people stayed for 180 days in a similar closed ecosystem in the early 1970s. The longest blackout, due to a malfunction of an electric switch in the lab, lasted a whole night in the "comprehensive cabin," the living quarters of the volunteers. "Luckily, it was in the evening, and the volunteers simply went to bed, without being affected much," Liu recalled, adding psychological data will be analyzed as part of the research. The Yuegong-1 has a total area of only 150 square meters, consisting of two plant cabins and the comprehensive cabin. The volunteers grow fruit -- principally strawberries -- and vegetables. Yellow meal worms, which are edible and contain high levels of protein and other nutrients, are raised in the cabin. They are ground and mixed with floor to make a bread-like substance or fried on an electric stove in an oil-water mixture. "Except salt, seasonings and a small amount of pre-stored pork and chicken, everything in the cabin is regenerative," said Liu. The volunteers have access to the Internet, play chess and darts, do yoga and ride exercise bikes. Volunteer Wang Wei said that over the past 200 days, she had learned to make steamed bread, dumplings, buns and even mooncake, a traditional snack for Mid-Autumn festival but one which is rarely made at home. "I'm planning to cook the Spring Festival family banquet all by myself," Wang, 26, told Xinhua. Wang hopes to graduate from her master's degree this year with a thesis on the effect of light on human physical and mental states. In the cabin, they went through a six-week shading experiment, with no natural light. "It was the toughest time for me," she said. "No sunshine and the pressure from my thesis made me fatigued and a little depressed." Wang said chatting with her fellows helped her through her anxiety. She missed many chances to find a job because of the 200-day isolation and has decided to continue studying for a doctorate. "But the thing I want to do most right now is to eat some oranges. There were only strawberries inside," she said. Chief designer Liu said following the experiment, her team would apply to have a mini-BLSS system on board a lunar or martian probe, with another set on the ground as a control. China has made great progress in space exploration in recent years. A manned docking in space was carried out in 2012, followed by landing a rover on the moon a year later. Earlier this week, the country executed its first successful lunar laser ranging to prepare for the launch of the Chang'e-4 lunar probe later this year. Tian Yulong, secretary general of China National Space Administration, said the research findings of the Yuegong-1 experiment will help with lunar missions and the future exploration.